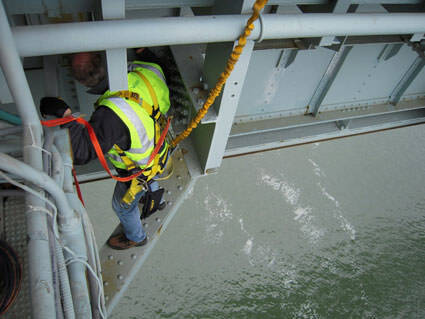 An employee from the Center for Operational Oceanographic Products and Services installs an air gap sensor which measures bridge clearance on the Verrazano-Narrows Bridge, New York. The sensors take readings every six minutes to account for changes in water level, volume of traffic crossing the bridges, and air temperature, all of which cause bridge clearance to fluctuate. As ships become taller, some are passing under bridges with just inches to spare. This new capability is available through NOAA's Physical Oceanographic Real-time System, which provides quality-controlled oceanographic and weather data at U.S. seaports to aid navigation.